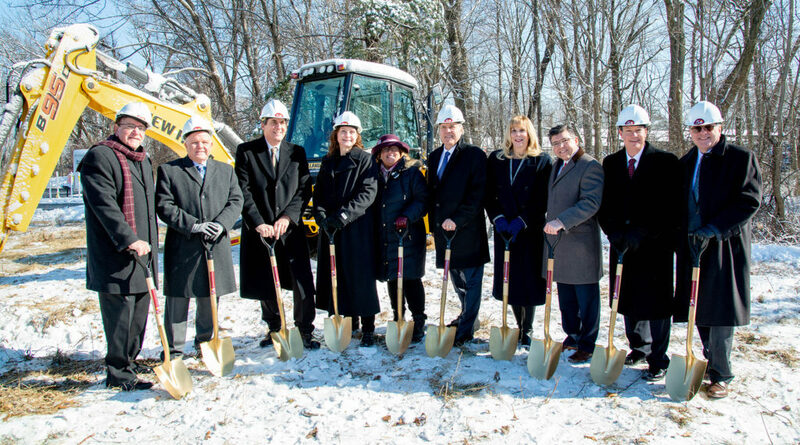 On Wednesday, January 30th the Morris County Board of Freeholders, County College of Morris (CCM) Board of Trustees, regional and state officials, and industry leaders gathered at the County College of Morris to mark the ground breaking of the Advanced Manufacturing and Engineering Center. Approximately 100 people gathered to celebrate the $11 million plan for the future facility being built to address the growing industry demand and employment needs in the manufacturing and engineering industries. The Advanced Manufacturing and Engineering Center will feature the latest technology and equipment designed to aid and develop the skills of individuals entering the workforce while also providing current employees with forefront training. The new facility will bring to the campus many opportunities for collaborative learning and connections with industry representatives to work towards innovations and solutions within the manufacturing and engineering sectors. The 31,500 sq ft center is expected to open spring 2020, and will feature many advanced and cutting-edge resources, some of which include two electronics labs, two prototyping labs, two computer labs, a 3D printing room, an analysis lab, an automation and controls/robotics/emerging technologies lab, a measuring and materials testing lab, a welding lab and more. The center is being constructed on property the college owns near 675 Route 10, which houses the Public Safety and Information Systems departments. It will provide the opportunity to restructure current facilities to make way for the construction of The Paragano Family Foundation Healthcare Simulation Center, and the expansion of other healthcare programs. For more information on the college’s Manufacturing and Engineering programs, visit www.ccm.edu/academics/. For information on its Workface Development programs, visit www.ccm.edu/workforce/.